I aim to narrow the distance between design education and practice and build a bridge connecting the two… a direct reflection of my own creative path and journey. I’m a hybrid of industry and academia. There’s no question I’m drawn to both sides of design and have always had one foot in each. My roles as Creative Director and Creative Strategist have armed me with industry experience I’ve adapted for use in the classroom as I mentor and guide students to set higher graphic standards and achieve industry level design solutions. If advancements in graphic design occur, I discuss this information with students and incorporate the innovation into the course curriculum (via new assignments and proposed courses) to better align design education with our industry’s ever evolving demands. Whether I’m teaching in the classroom or working in the industry as a creative lead, I encourage my creative team to use their own voice, insight, ideas, perspective, illustrations, photography, writing, hand drawn typography, their own… in their designs. Unique and one-of-a-kind means their work has a platform to stand out from the endless parade of other designs that consumers come in contact with. I ask my creative team to embrace spontaneity and hunt for “happy accidents” in their work. Creative exploration can result in the discovery of a single, unique idea they can build an entire campaign upon. I encourage my creative team to invite the viewer to interact with their designs, not just passively observe them. Focusing on involving the viewer will ultimately help get the message across. I advocate my creative team using unexpected artistic methods throughout their creative process. I want them to push outside the computer-generated designs consumers are accustomed to. It will surely bring originality and enhance their message. I must stress that graphic designers can further develop their understanding of human nature and create messages that personally connect with an individual. 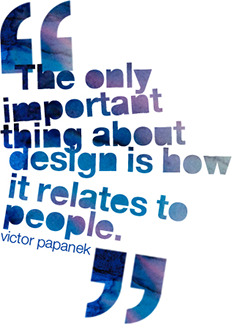 We’re all rather egocentric when it comes to design. Most graphic communication is created on a mass scale; meant to be read by numerous viewers, and yet we engage with it as if the design is speaking directly to us. Successful messages are those that you can relate to, you can laugh along with, or touches you on some level. I firmly hope my work invites the viewer to become involved, gets them to act for a cause, educates, and informs. In the simplest of terms, inspires and motivates the viewer to do something! Designers have chosen to meld their artistic gifts into the highly developed art of graphic communication. There is power in our visual voice and with this power comes great responsibility. One visual and one word can affect the lives of many. I want to continually teach this vital lesson to my creative team while finding ways to connect emotionally with the consumer. Professor Ballas is not just and educator, he is a performance driven designer that expects the best from his students. Organization and reliability are the first two words that come to mind when I think about Professor Ballas’s classroom demeanor. From his carefully organized class syllabi, to his online video recorded feedback, students are always capable of finding the necessary information regarding their work. As both my supervisor and my professor, Professor Ballas elevated my work with incredible suggestions and also acted as a mentor to guide me in my pursuit of a graphic design career. I can truly say that Professor Ballas was a huge part of my success my senior year. Decidedly nonpareil in vision, philosophy and methodology, Dean Ballas is a visual communicator whose keen passion for design and dedication to accurate, focused and clever communication extends beyond the bounds of commercial design into the realm of design education. While an undergraduate at Lehigh University, I had the pleasure of working with Dean during DES053: Graphic Design I. Dean favored a class structure that continually encouraged kinetic communication that was both insightful and critically constructive, encouraging students to become involved in the greater conversation of design through active, engaging and vivacious collaboration and critique. For example, every class began with a peer review session in which we would discuss and analyze to further encourage progress, and each project ended with a critique in which each student would review and write strengths and weaknesses of his or her colleagues’ designs. I firmly and confidently recommend Dean as not only a proficient designer, but as an excellent mentor. Dean was my Graphic Design professor in my last semester at Lehigh University. As a Graphic Design major, I can honestly say I learned more from Professor Ballas in that one semester than I did in my previous 3 years of design study. His enthusiasm for graphic design made me eager to learn and develop my skills in the Adobe Creative Suite programs. With the knowledge I gained from his course, I graduated from Lehigh and acquired a job in the field I love at a flourishing media agency. Professor Dean Ballas always holds a high standard. Dean inspired and motivated me to achieve my fullest potential and beyond. Numerous things stand out to me about his work ethic and how he conducts his classes compared to other classes and professors I have had. One example, which some may over look but I really appreciated, was when sharing videos/links on current design related topics he always had the websites preloaded and ready to view. This courtesy resulted in no wasted time waiting for videos to buffer and enabled the course discussion to remain fluent and engaging. This is a perfect example of how prepared and detailed-oriented he is when it comes to developing and presenting course related material. After having Professor Ballas for the first time during my sophomore year, I planned my remaining junior and senior schedules around the classes I could take with him. He’s a hard Professor but the kind of Professor/Creative Director you want to work hard for because you know working together you’ll achieve great results.